Nearing the high water mark? The Big Wood River is running high and fast with spring snowmelt, and county staffers say valley residents should prepare for flooding. The Snake River Plain, Blackfoot and Pocatello have all been warned of possible flooding this weekend by the National Weather Service. No flood warnings had been issued for the Wood River Valley by Thursday, but Blaine County Disaster Services Coordinator Chuck Turner said that doesn't mean valley residents are immune from floods. "Every day that the runoff is delayed, that's more water that has to come down in a shorter amount of time," he said. Snowpacks statewide are well above average, according to the most recent water supply outlook report from the Natural Resources Conservation Service. The snowpack in the Big Wood basin remains the one of the lowest in the state, but it still stands at roughly 123 percent of average—the highest snowpack since 2006, the report states. That was a record flood year for the valley, especially in Hailey, as the rising river flooded the Della View neighborhood in mid-May. Waters reached 7 inches above the 6-foot flood stage in Hailey, with moderate flooding reported in Ketchum, Bellevue and elsewhere. Turner said the river and snowpack are not as high as in 2006, but the delayed melt-off raises the odds of what he called a "large water event," or significant water-flow surges and flooding. "Many years, the snowfields on the lower elevations and valley floors are all but gone," Turner said in a news release. "This year ... there's still an impressive amount of snow in the upper drainages." What's now up on the mountainsides must come down, possibly much of it this weekend with temperatures set to spike into the low 70s. However, Turner said it's difficult to predict exactly what impacts the weekend weather will have on flood conditions. 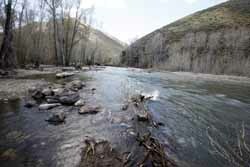 "It's going to increase runoff, but to what extent, it's very difficult to say," he said. "Whether [flooding] occurs or not depends on temperatures, both daytime and nighttime, and rain events." Rain increases runoff and raises water levels, but the service report states that moderate daytime temperatures combined with freezing nighttime temperatures could allow the snowpack to melt evenly with less risk of flooding. As temperatures may not reach freezing overnight in higher elevations this weekend, Turner urged residents to take steps to prepare for flooding. County code compliance specialist Megan Stelma said many homeowners along the river use water bladders and sandbags to protect their properties from rising water. As long as these measures are just protecting homes or other buildings and not interfering with the floodplain, Stelma said a permit isn't required. "If [landowners] are protecting their whole lot and not just the structure, that's not OK," she said. "That water has to go somewhere, and it could affect their neighbors." Stelma said landowners that need more extensive measures, such as to protect a culvert, should contact county Land Use and Building Services to apply for an emergency stream-alteration permit. Turner said that even if the river doesn't flood, high water poses risks to residents. Children and pets should avoid high water, he said, and all area residents should be on the alert for flash flooding. According to the Federal Emergency Management Agency's website, residents at flood risk should keep alert to weather forecasts and stay tuned to the local news, as well as move out of the area if there is any risk of flash flooding. Turner said all homes along the river could be at risk during flood stages, especially those in Hailey, East Fork and the mid-valley. "My job right now is to make people aware of this," Turner said. "Everyone around the rivers and side drainages should be aware of this situation."